We don’t like to see text slang in students’ writing. Does it bother you too? A survey of 2,462 Advanced Placement (AP) and National Writing Project (NWP) teachers found that digital technologies such as social media sites, cell phones, and texting are shaping student writing in a variety of ways. They describe the unique challenges of teaching writing in the digital age, including the “creep” of informal style (text slang) into formal writing assignments. These teachers also saw the effect that shortened forms of expression, e.g., Twitter, Facebook, texting, had on students’ writing stamina, willingness, and ability to write longer writing pieces. Another study published in New Media & Society, a top-ranked, peer-reviewed journal, found that most adolescents are not able to switch between writing text messages and using correct English grammar for classwork. 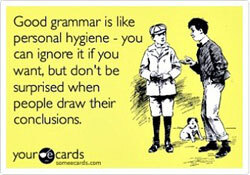 A failure to use correct grammar and spelling can have ramifications in both college and careers. It can mean the difference between being offered a position or being rejected, all because of poor communication skills. But this isn’t something you haven’t heard before. Children in the U.S. between the ages of 8-12 spend an average of six hours a day using media (41% of this time is on a cell phone). Does this put written English at risk? Are basic written communication skills being set aside? At WriteSteps, we are motivated to do something to be sure our rich tradition of written language is not lost. Click on the image above to download the poster for your classroom. Helping your students understand the difference between formal and informal writing is the first step. You can also build strong digital writers the “write” way! Have your students practice their formal writing in a digital environment that is separate from texting and social media. 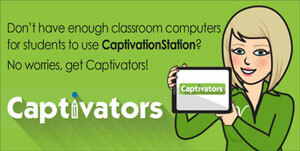 CaptivationStation is the solution that teaches digital learners standards-based writing and grammar. It’s a first-of-its-kind instruction and practice platform where 3rd-5th grade students acquire their writing and grammar instruction through Captivator videos, write online, and receive peer and teacher feedback. We understand each classroom has different technology needs. Captivators, the daily writing and grammar instructional videos found in CaptivationStation, can be added to an eWriteSteps account. CaptivationStation allows students to use the technology they love and holds them accountable for learning and applying formal writing skills, ushering in the next generation of competent writers! Click here to learn more and see the powerful platform in action. 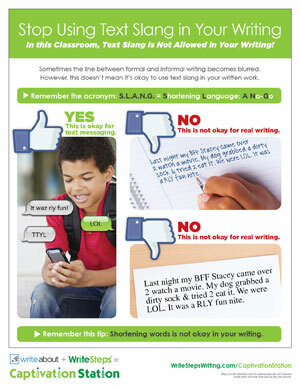 Have you seen text slang creeping into your students’ writing too often? Let’s revolutionize writing and grammar instruction together and change the way students are communicating in this digital age. Our favorite blended learning specialist, Joanna Van Raden, will be presenting, “Blending the Writer’s Workshop,” during the Iowa Technology Education Connection Conference. Her presentation is held from 8:00 a.m. to 8:50 a.m. in Room 320. Don’t miss it! Stop by booth #222 at the Lutheran Education Convention and say hello to Kim Gates! She will be there to answer any questions you have about WriteSteps! Joanna Van Raden will be presenting, “Blending the ‘Write’ Stuff” during the Information and Technology Educators of Minnesota Conference! Make sure you are in Conference Room A from 12:00 p.m. to 12:45 p.m. if you want to learn from a blended learning expert!